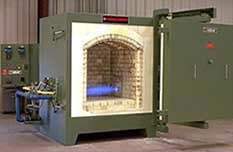 HED INTERNATIONAL all new USA series of high temperature kilns are designed to meet capacity requirements from 5 to 20 cubic feet. The kilns feature a full opening, double hinged door which provides the operator with easy access for loading and unloading of the entire product setting area. The door has a parallel guide that ensures exact positioning when closing and keeps the Hot Face away from the operator as it is moved to the side when opening. The HED International Cool Skin technology provided on the kiln door ensure skin temperatures of less than 40 F above ambient. Swivel style clamping devices on the four corners ensure a positive door seal throughout the firing cycle. The ISOMAX combustion system utilizes two (2) high velocity burners that are positioned to fire below the product setting space in a staggered relationship. A multiple loop programmer provides control of both the heating and cooling profiles. Oxygen enrichment and atmosphere control systems are available. Using this combustion package it is possible to maintain holding temperatures as low as 90°C (184°F) while still having the thermal input capability of ramp rates as high as several hundred degrees per hour. Temperatures up to 1800°C (3272°F) are achieved with the oxygen enrichment system. The fifteen-inch thick refractory wall includes a bubble alumina hot face that is secured by an exclusive interlocking anchor design. The combination of high velocity burners, multi-loop control and a high efficiency lining design insure superior firing uniformity and repeatability.